Annie Lennox met with the Mayor’s Advisor on Health and Youth Opportunities Pam Chesters at City Hall in London yesterday, as part of a roundtable bringing together representatives of HIV organizations and people living with HIV. The first to have taken place since Annie Lennox’s appointment as the Mayor’s unpaid London Ambassador for HIV, the aim of the roundtable was to begin developing a program of activity to tackle the challenges faced by people affected by HIV. Key issues they discussed were the promotion of positive attitudes towards sexual health amongst young people and the impact of stigma on whether individuals get tested or seek treatment. More than 40,000 people are estimated to be living with HIV in the capital, 27% of them undiagnosed. 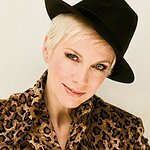 In many cases this is likely to be due to the stigma that may be associated with HIV, something that Annie Lennox is keen to challenge. The Mayor of London, who originally met Annie Lennox in 2009, published the capital’s first Health Inequalities Strategy earlier this year, which sets out measures aimed at improving the health of Londoners. The roundtable that met today included representatives from a range of organizations, including Terrence Higgins Trust, National AIDS Trust, African HIV Policy Network and Body and Soul. The GLA anticipates broadening the number of those involved as it develops its HIV program with Annie Lennox.